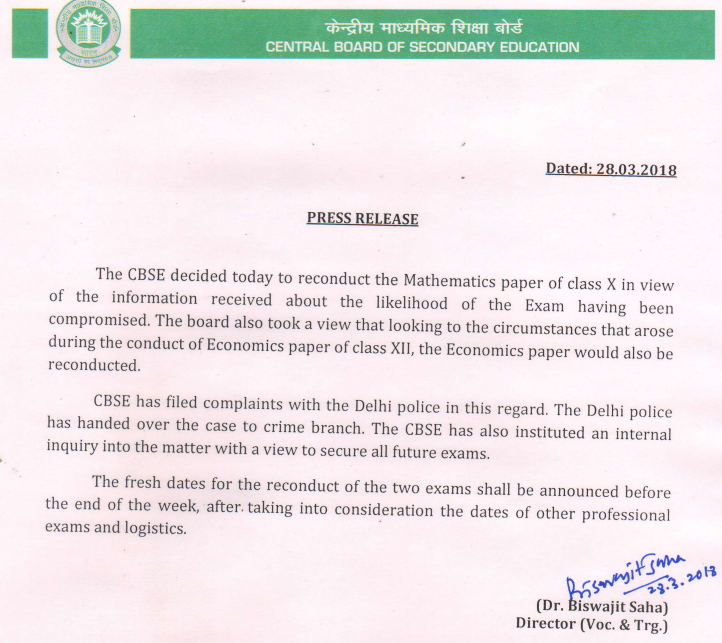 CBSE Chairperson Anita Karwal has said the decision to hold re-examination of Mathematics and Economics subjects was taken in favour of students. Talking to reporters in New Delhi, she said, new dates for the examinations will be announced soon. Ms Karwal said, the students need not to worry about anything and the Board is with them. Talking to reporters in New Delhi, she said, new dates for the examinations will be announced soon. The CBSE Chairperson said, the students need not worry about anything and the Board is with them. Union Human Resources Development Minister Prakash Javadekar has termed the CBSE examination paper leak issue as “unfortunate” and said the culprits would not go scot-free. He said that the matter would be thoroughly probed as it has “stained” the reputation of the CBSE, which is known for conducting examinations fairly. He said the HRD ministry has set up an internal inquiry over the issue and the necessary changes will be done in the exam pattern in the future. HRD Minister says PM has taken note of CBSE question paper leak incident & internal probe has been ordered. Javadekar said the paper leak incidence is very unfortunate and he understands the anguish of the students and parents. Meanwhile, the crime branch has questioned 25 people, including owner of a coaching centre, 18 students and some tutors, in connection with the alleged leak of CBSE examination papers. Briefing reporters, Special CP, Crime, R P Upadhyay said, two cases have been registered in connection with the paper leak case and a special investigation team has been set up to investigate the matter.